Buy your 2019 Season Membership now and ride the whole 2019 snow season. Find out more here. Make the most of the 2019 snow season with a '6 Day Any Day' pass on sale until the 30 April 2019! Adult price: $549 - ski for $92 a day! Kids / Over 65 price: $309 - ski for $52 a day! Get yours now from the eStore. Looking for the best deal on lift passes? Make sure you get in early. Plan ahead and book online, and get lift passes from $66. Work out when you want to visit and get it booked. The earlier you book the better. Just like an airline, lift passes are always best value in advance as opposed to over the counter on the day. When you choose to visit can make all the difference. Save big mid-week as well as in June and September. A B-TAG is a card that allows you to access the lifts of Mt Buller, it is reusable and can be loaded with lift passes, lessons and more. Everyone needs their own B-TAG, put it in your jacket pocket when on the slopes and touch on at the chairlift entry gates to get going – make sure you add lift passes first! 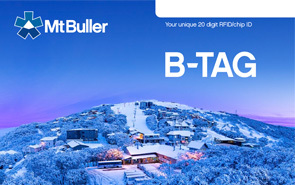 Purchase your B-TAG online, from any ticket window on the mountain or any Buller Sports outlet at Mt Buller or Buller Sports Mansfield. Find out more information on B-TAG's here. Purchase lift passes online up to midnight the night before you ski, and save time & money off the regular pass window price. Or add days to your existing B-TAG and head straight to the lift! All lift passes are non-transferable and non-refundable. Any Lift pass adjustments needed may be made in-resort and will be based on the window rate pass on the day of the adjustment. You don't have to be a skier or boarder to explore the mountain! Simply jump on the Northside Express chairlift and enjoy a breathtaking ride across Mt Buller's slopes. The Northside Chairlift on the northern slope departs from the day car park and will take you to Spurs Lookout. Tickets are available from any ticket office or Buller Sports Outlet (not available online). You can purchase single or multiple ride tickets. Try something new with an introductory 2 hour first timer lesson to get you safely mastering the basics, with a beginner slopes lift pass. Discover lessons are held at 9am, 11am and 1.30pm every day as well as 10am on weekends. Find out more information here. Weekends are longer at Mt Buller this winter with our brand new Twilight Sessions in July and August. On Saturdays and Sundays you can ski, board or take a lesson on Bourke St ski run or go tobogganing in the Village Snowplay Park until 8.30pm, all under lights! Add live entertainment and extended shuttle hours for the best 'long' weekend around! 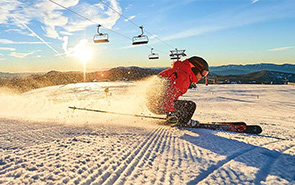 A Season Membership is an unlimited Mt Buller season pass, valid on all lifts every day of the season. 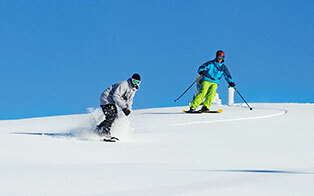 A money-back guarantee on accommodation, lift passes, rental and lessons if there is insufficient snow cover. 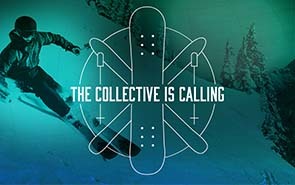 Mt Buller joins Mountain Collective. 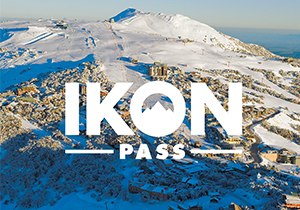 Mt Buller is now on The Ikon Pass!